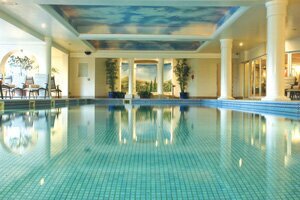 If you're planning on a break in Suffolk and having a pool to relax in is important to you then you've come to the right place as we've gathered them all together for you. To make it easier you might want to search by family hotels, luxury hotels or spa hotels, but if you just want the full range on offer, carry on! 2-tier floodlit driving range with heated bays, Americangolf Shop and Doctorgolf Teaching academy. Modern, well-equipped health club with spacious gym and indoor, deck-level swimming pool.